The classic 1942 movie Mrs. Miniver tells the story of a middle-class British family whose lives are disrupted by the start of World War II. It won 6 Oscars, including Best Picture, and was nominated for 6 more. I’ve heard from a lot of readers who say this is one of their favorite movie houses, so I thought we’d take a closer look at it! 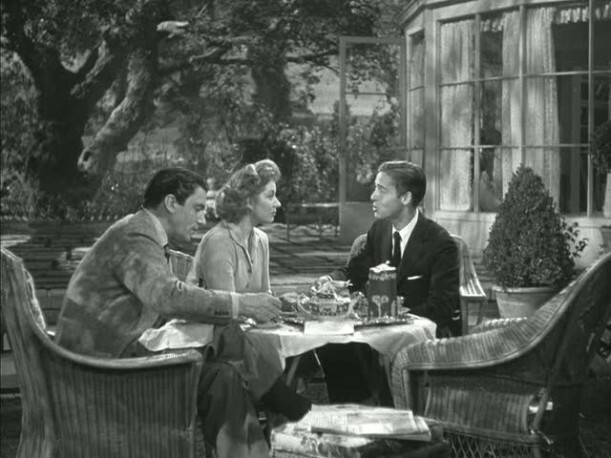 The movie takes place in England, but it was filmed entirely on a set inside MGM Studios. When the movie was filmed, Americans were still feeling neutral about the war in Europe. For the most part, the U.S. didn’t want to get involved. But then Mrs. Miniver came along and grabbed the country’s attention. 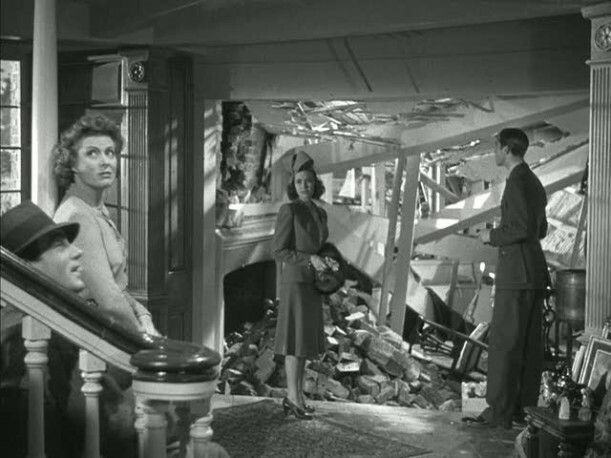 It was hard for moviegoers to remain neutral after they saw Mrs. Miniver’s beautiful house with the white-picket fence fall victim to the Nazi air raids. Winston Churchill himself said the movie’s propaganda value was worth more than a dozen battleships. The family deals with the daily aerial bombardment from German planes. The movie was based on a fictional English housewife created by Jan Struther for a newspaper column in the ’30s. The handsome Walter Pidgeon played Mr. Miniver, one of the hundreds of boat owners summoned to Dunkirk to help evacuate British soldiers. The actor was not British, though. He was born in Canada and became a U.S. citizen after moving to Hollywood in the 1920s to star in silent films. Greer Garson was discovered by Louis B. Mayer in 1937 when he saw her performing on a London stage. Her first part was in Goodbye, Mr. Chips (1939), which earned her an Oscar nom. She also starred in Pride and Prejudice with Laurence Olivier. They were miscast as Elizabeth and Darcy (they were both in their 30s at the time), but I love that version anyway! President Roosevelt printed leaflets of the minister’s speech in the film to drop over occupied Europe. Greer Garson won an Oscar for this role and holds the record for giving the longest acceptance speech in history. Legend has it that she rambled for an hour, but it was really only 5 1/2 minutes. A sequel called The Miniver Story followed in 1951, and it was actually filmed in England. Greer Garson was only 11 years older than Richard Ney, who played her oldest son. They fell in love while filming the movie and married in 1943. Four years later, their nasty divorce put an end to Ney’s Hollywood career because Garson was so universally loved. If you want to revisit the movie (or check it out for the first time! ), it’s now on DVD, as is the sequel, Mrs. Miniver’s Way (Amazon affiliate links). Has anyone else seen them lately? I LUV B&W movie sets!!! I has home sick about a year ago and watched this movie, it was brilliant (and the house too). Oh, my! I feel I went all the way back to that time! This post is so interesting, Julia! I really enjoyed it! Thanks Julia…I don’t remember seeing this movie, but I will look for it now. I love the old black and whites. Thanks Julia! I will have to see that movie! I have not seen this movie, but Im going to add it to my Netflix tonight! I went through a period (in college, when cable wasn’t in the budget) of watching classic movies like this, and it’s high time I started doing it again! I totally understand the time it takes to do the movie house posts…I’ve got a handful in my “hopper” that I just can’t seem to finish. Thank you SO MUCH for this post, that is one of my favorite movies of all time. Of course I would recognise the house as I must have watched it everytime it came on TV. I too highlighted the TV Guide listings and this movie was one of my all-time favorites. 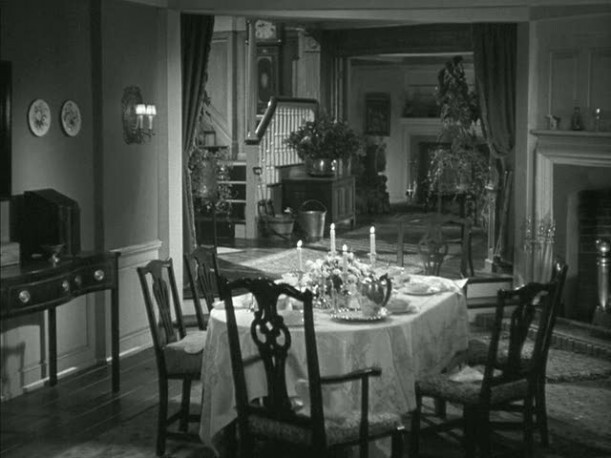 Love the Gull House in The Ghost and Mrs. Muir (black and white version) and of course the movie. Thanks for sparking memories! This time you hit one of my very favorite movies, and probably my favorite movie house. But I don’t like knowing about the actors–I prefer to think of them as the characters they played; keeping make-believe in the realm of fantasy. Oh, really? I love learning as much about the actors as I can. I watch most movies with my laptop now for that reason. I even have to track down who the bit players are in the background. I imagine you don’t enjoy my posts very much, then! HI! I agree with Mary. Who would ever watch a Joan Crawford movie if her ‘real’ life affected viewers choices. I love really juicy *itchy melodramas from the 40s and 50s and Joan Crawford is your gal ! 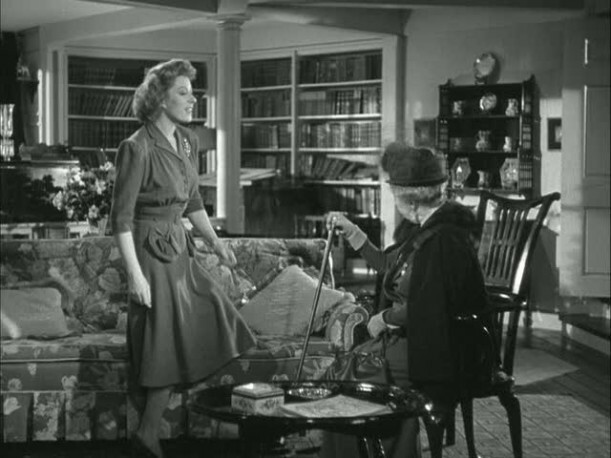 Love the post Julia – Mrs. Miniver is one of my all time favorites love Greer’s version of Pride and Prejudice as well – I agree, totally miscast but I watch because of the costumes. Love hearing about the actors. I guess its different sorts for different sorts! I just found your website today. I wish I had known about it from the beginning! It is now one of my new favorites. Mrs. Miniver is one of my all-time favorite movies. 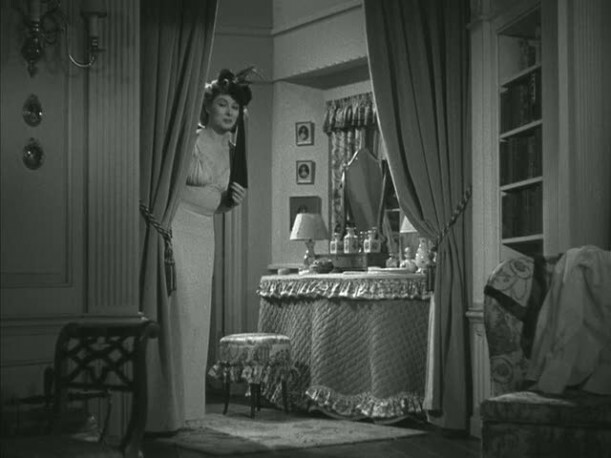 That house had the same quiet elegance as Greer Garson. She is much loved where I am from in Texas. Very nice read this morning Julia. I love black and white movies also. It seems that everyone in these movies, no matter their income, lives in exceptional homes. Oh, I must watch this again, including the sequel, which I never knew existed! One of my favorite movies, and movie houses as well. The dining room set is very, very similar to the one my grandmother had. Thanks for the fantastic post!! I just saw this movie for the first time this past March, when my 80 year old mother was visiting with us. We were looking for old movies to watch, and she remembered this one. As soon as I saw the house, I thought of your Movie Mondays, Julia, but you beat me to it! The movie is great, and I enjoyed reading your background info on it; it makes it even more interesting! Your blog is one of my every day reads- I’m hooked! I really enjoyed the movie and was of course looking at all the details of the house. I knew about Garson and Ney who played her son, but didn’t realize that Ney was Minka Kelly’s grandfather. We saw Minka off-Broadway last month and she was more beautiful in person and was awfully sweet to us. I haven’t seen this movie yet, but I will rent it. I will miss the Movie Mondays, is my favourite day in the web. This house is amazing, all rooms are incredibly, cozy and elegant, every picture is a pleasure, thank you!! i haven’t seen this one. this thought came to me…has nothing to do with this movie. have you ever done “you’ve got mail” with Meg Ryan and Tom Hanks. There is a swan painting in that movie that I love and I have no idea how to track it down. Any ideas?? Yep, I featured “You’ve Got Mail” (see those photos here: https://hookedonhouses.net/2009/06/28/meg-ryans-brownstone-in-youve-got-mail/). I get lots of questions about that swan painting but sadly have no idea where it came from or where to get it. I’d think an art gallery type of place might be able to track it down, though. i LOVE that house!! i also love movie mondays and will miss them….but, it does look like it would be hugely time consuming… so, thank you, julia for all of the movie mondays that you have posted, i’m glad it was you, not me, doing all of that grunt work!! 🙂 your blog is always fun with or without mm’s! now, go enjoy your summer! Hi Julia! Oh, what a wonderful post! I loved this movie and the house is just amazing. They do not make movies with heart like this any more, do they? Thanks again for all of your research you do on your great posts! Can we persuade you to at least do a “Movie Monthly”….it’s one of my favorite features provided by your interesting and informative blog. All of the effort you put forth is truly appreciated by other house junkies. Big hug and thank you for past and future posts. I’ll be still doing them–just taking the pressure off myself to have one every Monday. Glad you like them! They get the least amount of traffic of any of my posts but take the most time to write, so I felt like I needed to face facts and make some adjustments. Oh wow. I’m surprised that they get the least amount of traffic. I would think that they would get the most. This is my favorite part of your blog. But I’m soo glad you are taking a break. I had no idea about “Lyla Garrity’s” lineage. Very cool! I hear you on the tv/movie set thing. I review a movie a week for my own blog. I thought it would be easy to do, but you know what? It’s time-consuming as can be (although it is fun!). I look forward to your posts, as it’s a great way to start my week. I loved that movie, especially the scene where Mr. Miniver is trying to build up to Mrs. Miniver the fact that he bought himself a new car by saying that the old car had bad tires, and Mrs. Miniver tells him it’s OK to buy a new set of tires. I own this movie on DVD and I absolutely love it. One of my favorite parts is the rose contest because Lady Beldon showed that she had a kind heart. What a gorgeous house! I too love classic movie sets. The directors put a lot of thought into the houses and they seem to be a character in themselves. That’s one reason why I love watching classics. 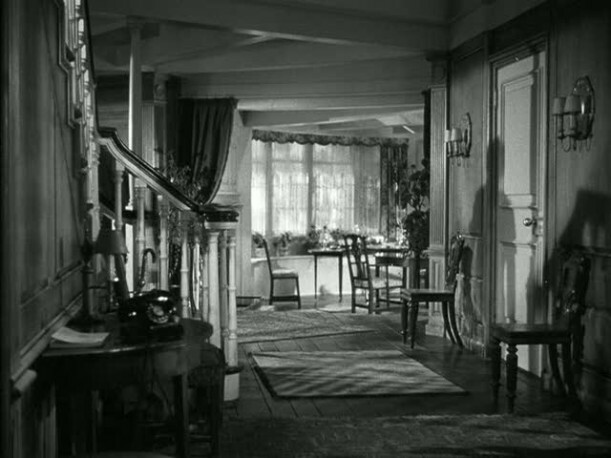 In fact, I just watched some mystery classics the other day and the interiors were gorgeous. I think it’s fun learning the different facts about the actors themselves and hope that you will continue to do them in your posts. Thankyou so much for taking the time to do these homes. I’m so surprised that the tv/movie posts get the least amount of traffic. I always thought the Friday weekly links post got the least. I personally think these are my favorite posts. I love coming to see what house you are going to do next. Thankyou! At least these posts get more traffic than those. If it is how long the posts are, people don’t have to read the posts themselves, they can just look at the pictures. Maybe you can come with something else to do on Mondays or just keep the Sunday open houses up until then. I can’t think of anything else you could do. I enjoyed that scene with Lady Beldon too. Did you watch Downton Abbey where they basically duplicated that scene? 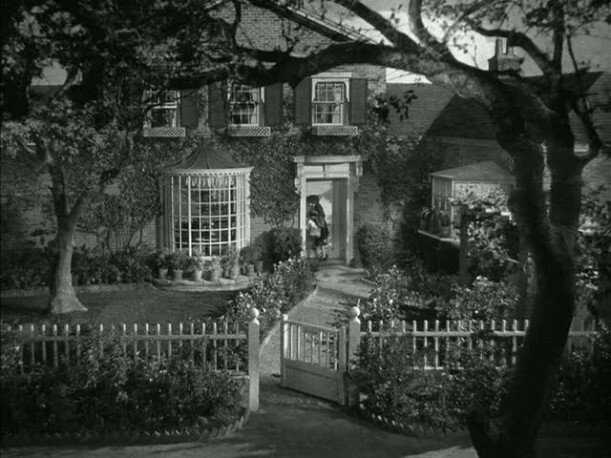 Would have loved to have Mrs. Miniver’s house. That is one of those movies I watch every time it’s on TCM. Love the story, but love the house even more. I’m surprised too that Movie Mondays get the least traffic. It’s one of my favorite things. But totally understand how time consuming they must be. So I will look forward to them whenever you post them. Thanks for all your work putting them together. 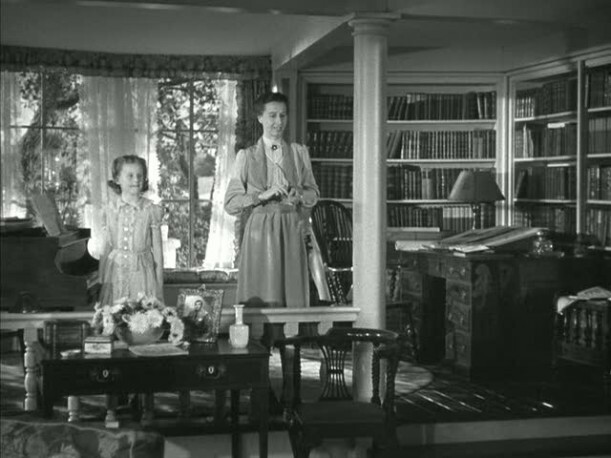 I’m with Carol M, would love to have Mrs. Miniver’s house. Great post today! Nothing better than classic movies! I enjoyed it so much! Thank you! I love your Monday posts. My mother was in props and movie design, so I really appreciate the artistry and work behind the scenes. The part she loved the most about her job was shopping with someone else’s money! Love Mrs. Miniver. Another B&W classic our family loves is “The Male Animal” with Henry Fonda and Olivia DeHavilland. I’ve loved that house for years–Professor Tommy Turner’s house. I don’t see it on your list. You might want to check it out! Most of the movie is humorous but then takes a serious turn at the end. I LOVE your movie Mondays – and this is no exception – the house has “feeling” – i love that in a movie house. I think my all time fav was “It’s Complicated” but of course that was because of the KITCHEN! But thank you for today and whisking us off to London! My fav house is the last one in Dark Victory with Bette Davis. Also another classic one is featured in The Great Lie with Davis and Mary Astor. The staircases, the windows, the antique furnishing are so lush to observe. And lack of color doesn’t detract one bit. Oh, I love this! Why is my own house so minimalist when I get such a warm happy feeling looking at these densely decorated rooms? The plates everywhere! Mrs. Minnver’s dressing table! I guess a lot of it is just nostagia for that world. Greer Garson is a favorite and I even liked her version of “Pride and Prejudice.” In spite of the wrong ages and wrong costumes, she had such a twinkle in her eye when she said her lines that she became my favorite Elizabeth. My favorite portrayal of Mary Bennet is in that one, too. I loooove this film. It always makes me cry and I’m always on the edge of my seat when the German is in her kitchen. Greer Garson is also great in Pride and Prejudice, even though they are wearing ridiculous Victorian hoop skirts…doesn’t matter. Still love it! Thanks for all the work you do on these posts (believe me I know how hard it is) and we will be thrilled with as many movie posts as you can give us. P.S. I love the kitchen in that house too! P.P.S. I love hearing about the actors. Keep it coming! Isn’t it fun to read about all of us who have loved this movie and the LOVELY HOUSE for so long! Having just found this site last month, I’m so sorry you are not doing the Monday Movie, but it is summer after all! Kick back a little, but I hope you can come back to it – love the stills! Referring to the scene with the rose contest in Mrs. Miniver – did anyone notice that Downton Abbey completely ripped this scene off? I loved Downton Abbey and cannot wait for it to return next winter, but I was a little shocked to see that scene lifted from a movie as beloved as Mrs Miniver – especially from a British production! 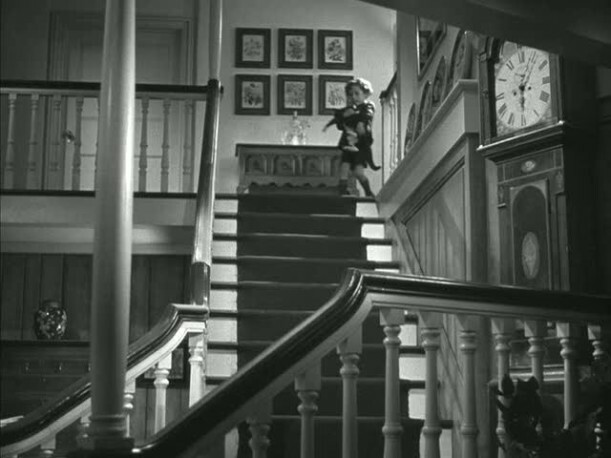 For those of you who love old b/w movies – try “The Uninvited” – amazing house and a very creepy/romantic movie with a surprising amount of humor. You’re right! Now that you mention it, Molly, it totally is the same storyline in Downton Abbey. That was kind of nervy of them, wasn’t it? I can’t believe I didn’t notice that before. OooooooH! The Uninvited, I discovered it last year fantastic movie even a bit scarry/tense at times ! Great house too!! I am going to look for this movie. What a nice house! I’m not sure I’d call it middle-class though. It looks huge, especially by 1940’s standards. I would have thought that a middle-class house in the US in the 40’s would be about 1000-1200 square feet? Middle Class in Britain and Middle Class in America mean entirely different things. Middle Class in Britain is a much higher designation than the same term in America. There’s working class, Middle Class and Upper Class, which can include titled families, also known as aristocrats. Britain’s Middle Class means educated, the professional class, the factory manager or owner, the doctor, the lawyer, the bank owner, genteel people who will live in detached homes with gardens instead of terraced houses or flats (unless it’s Mansion Flats in London). A “middle class” person in Britain, especially at the time of Miniver, would be very specifically identified. That’s why they probably used the term in the movie. The filmmakers were letting the audience know who these people were and what class they were–all important in Britain then, and even today, in spite of the fact that they deny it a lot. Today middle class can be used in Britain as a put down “oh he’s SO middle class.” Bring, staid, twee, etc. Thanks for clearing that up Julia! I was wondering the same thing. And thank you so much for presenting this house. It’s one of my all time favorites. I’m in love with Walter Pigeon. Interesting to know that he was Canadian. I always thought he was the quintessential English gentleman! 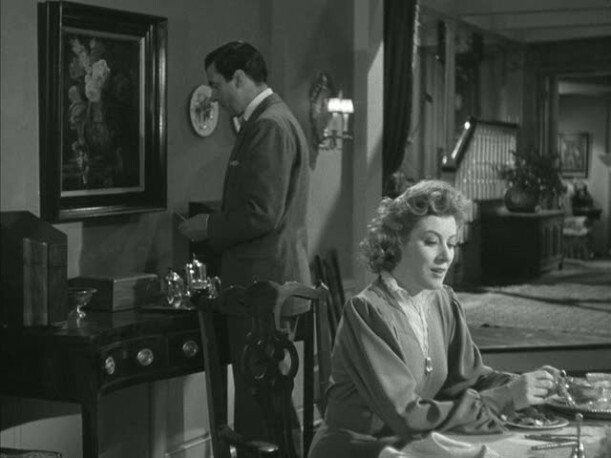 Have you seen ‘If Winter Comes’ with Walter Pidgeon and a very young Deborah Kerr? Set in England – fantastic house too, though on a slightly smaller scale. I just love old movies – I remember the first time I watched this I wasn’t sure I would like it. How wrong I was. It was terrific- a classic for sure. Love seeing all the still photos of the house. 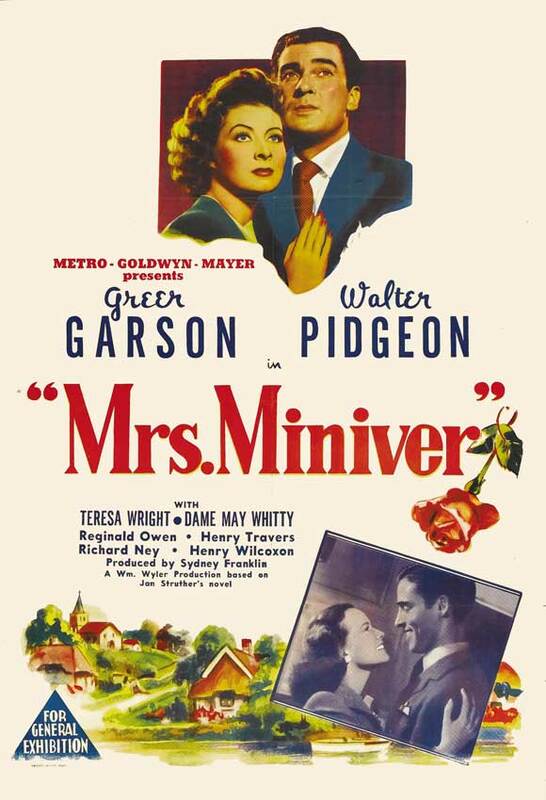 Oh, yes, indeed, Mrs. Miniver is one of my favorite movie houses and movies of all time. I loved this post and keep going back over the stills you have captured here, reliving the movie’s moments, and loving the settings. 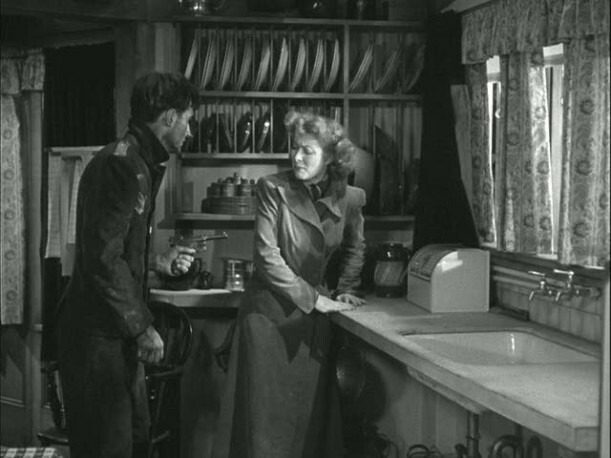 I admired the grit and determination of Mrs. Miniver, and her femininity as well. Even though I own the DVD, I will still watch it if TMC is playing it. Appreciate you posting here. I can only imagine the research and time that goes into this segment of your blog each week. Although I will miss my Monday movie houses, I do understand the need for break and will look forward to whenever you give a movie or television post. I absolutely love sitting down with a cup of coffee and reading your movie house posts! This is one of my favourite movies so I am particularly excited about it! I had never noticed the gallery wall on the top of the stairs or the charming open shelving in the kitchen, it’s amazing to see that so much has changed in the world since then but interiors have still stayed fundamentally the same! Thanks so much for taking the time to write these, they really make my day. 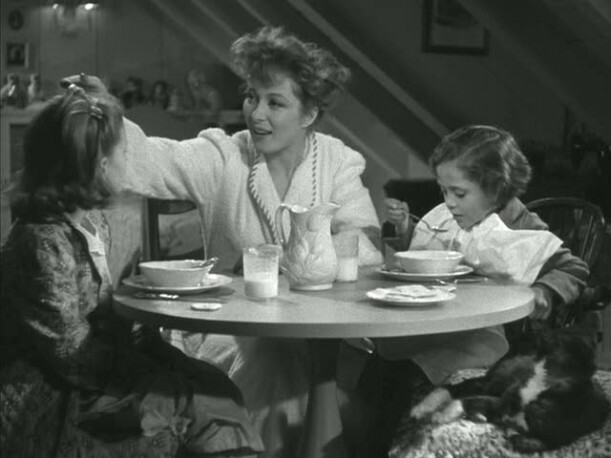 I grew up just loving Mrs Miniver. I live in Kent UK and there are many country houses of that type that remain. I often drive into the countryside near me for a spot of house envy. Another film I also loved was Random Harvest. The cottage that the newlyweds move to is lovely. Another real weepie with a glorious happy ending. I have been waiting for this post for months now, thank you! Glad to see my second and third favorite “house movies” are mentioned here – The Ghost and Mrs. Muir and The Uninvited…I don’t even know how many times I have watched both of those movies. Also, did anyone mention Rebecca with Laurence Olivier and Olivia deHaviland yet? That’s a house worth seeing over and over again! My husband and I visited the Eilean Dolan castle in Scotland a few years ago and I was delighted to see a real “Rebecca” room overlooking the sea. As I remember, it looked like a lady’s ‘dayroom’ with a desk and books and the most beautiful view – just the place to plan one’s day, write up schedules for the help and take tea at 4. Julia I am THRILLED to see the Miniver house! It is one of my all-time favorites. I own the DVD and have often paused it while viewing, just to get a good long look at the rooms in that house. I remember that Mr Miniver was an architect by profession, and the house itself was called “Starlings”. How cool is that, to have a name to identify your house? Thank you SO much for including this. Since you’re going all British, have you considered doing any of the PBS Masterpiece locales? Downton Abbey and the new Upstairs, Downstairs show beautifully photographed rooms. Thank you, thank you, thank you. I am swooning just looking at the Downton Abbey photos. Not at all sure that I can survive until Season 2 in Winter 2012. 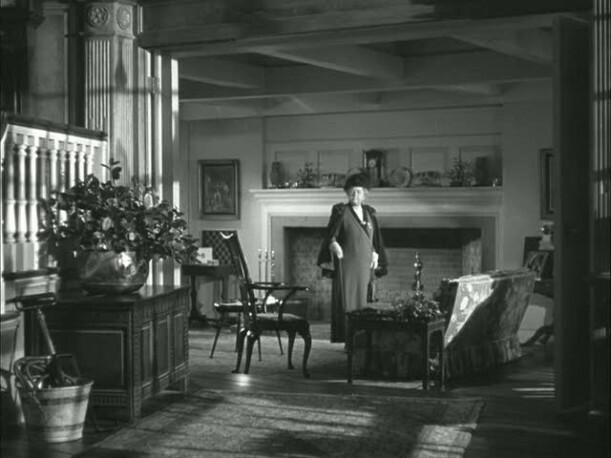 Mrs. Miniver is the movie that epitomizes timeless decor. This movie is my all time favorite movie house. What a treat to see it featured on your blog. Oh, how I wish there were color photos of this house! 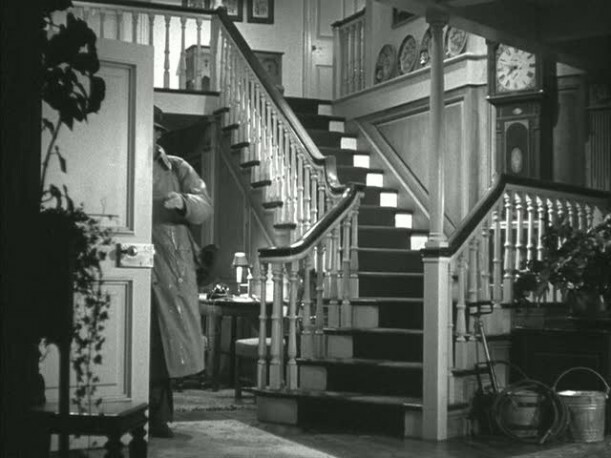 And Mrs. Muir’s , too…and the Christmas in Connecticut house, the Bringing Up Baby house, Rebecca’s castle & the little beach house…even the house in the original Father of the Bride, too. 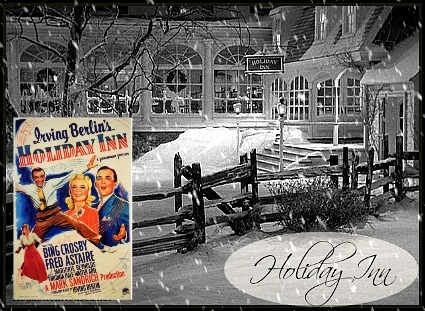 And the Holiday house with Cary Grant and Kathryn Hepburn. I could go on and on! I love all of them and more, and I really appreciate ALL of your posts, Julia. They make my day! 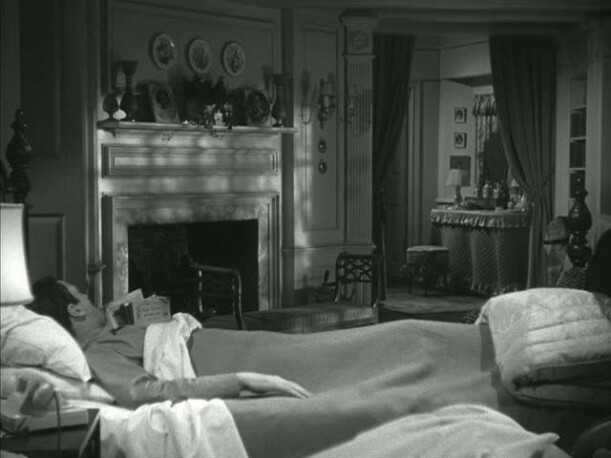 I also love old movies, and the houses they portray. However, although this is a gorgeous house, I am always irritated me by the fact it’s design is that of an American house, not an English one. Before the second world war, very few houses here had central heating, and houses were therefore much more cellular in design than American houses – it made it easier to heat a ‘cosy’ room. Open plan houses like this are not common even today. And we also smile at the bomb damage – even a house that suffered minor damage would be knee deep in dust and broken glass – it didn’t confine itself neatly to a small corner. Still this is carping – still enjoyed the movie! Great blog! I just love Greer Garson, and Mrs. Miniver is my favorite of her movies! I love WWII movies overall–my favorite genre, perhaps. And I love all movies and books set in wartime England. I’m a hopeless Anglophile, I must admit, and the stories of how the English people dealt with the horrors of the two world wars never fail to inspire me. 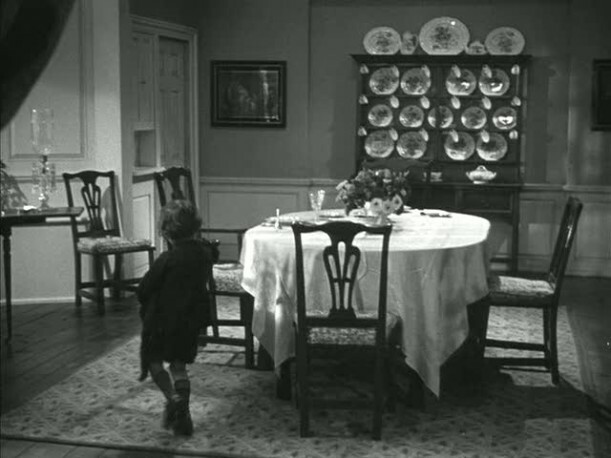 Thank you so much for this glimpse inside Mrs. Miniver’s house. I’ve always loved that house, particularly the staircase. I can’t believe you’ve written one of these marvelous posts every year for 2 1/2 years! Surely some astute literary agent has contacted you about compiling the best of these into a book! This is one of my favorite movies of all time! The closeness of the Miniver family and their real affection for each other comes across so vividly in this film. 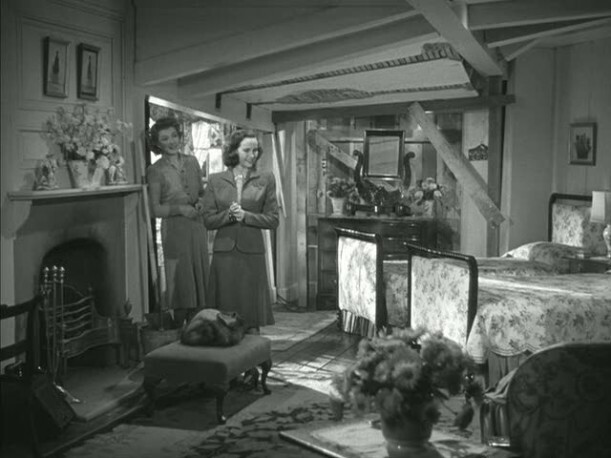 This is thanks to the wonderful acting, of course, but also is reinforced by visuals of the cozy rooms that Mrs Miniver so lovingly decorated to create their happy home. Thank-you for a wonderful wonderful post! Thank You Julia for posting this because Mrs. Miniver is one of my favorite movies! I wou;ld so Love to live in that house :)…. Oh I am so glad you did this house, I so love this movie! I have always loved this house, but it has always struck me that this is definitely an American house rather than an English one. Connecticut not the Home Counties. Still good. I recommend the book which has next to nothing to do with the movie. Was this also where The Ghost and Mrs. Muir was filmed? This is one of my favorite films and I’m so happy to see it on your site. Have you ever done a post on “Since You Went Away”? To me, it seems like the American companion to Mrs. Miniver. No, I haven’t seen that one. Thanks for the suggestion! 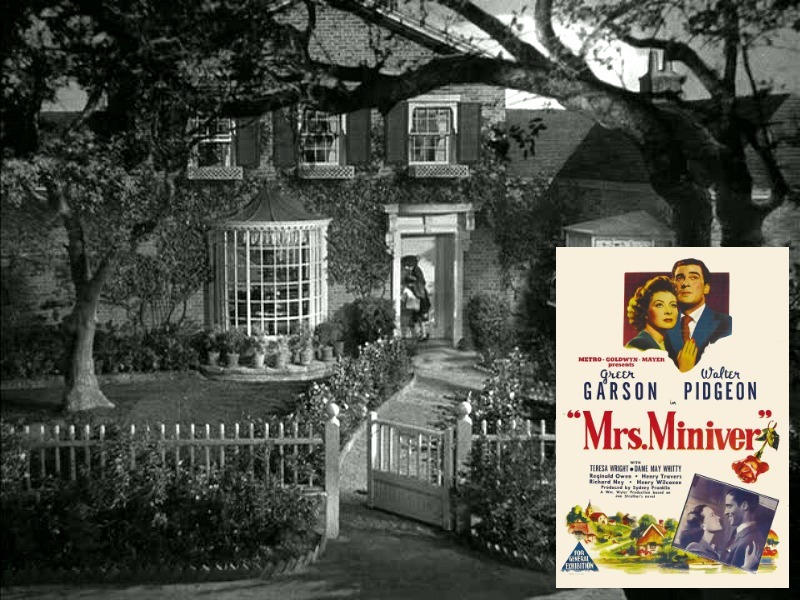 Many thanks for this post on Mrs. Miniver’s house, which I have always loved. My husband and I both like to watch it, he for the “Little Boats of Britain” and I for the interiors. It’s my ideal house, cozy and comfortable and cheerful, and yet elegant. I especially like the kitchen curtains, ruffled white sheers flanked by print panels. One thing not shown here is that the back of the house faces an estuary where Clem kept his boat, and there’s a path from the kitchen door down to the boat landing. Mrs. Miniver is one of my all time favorite movies. I have it on DVD as part of a 4-movie classic MGM offering. The house is beautiful. Great article and pics! Ha! This movie is on right now. I came over to my parents’ house for Mother’s Day and just knew I recognized that awesome staircase. Sure enough, asked them what movie they were watching and I knew you had written about it! 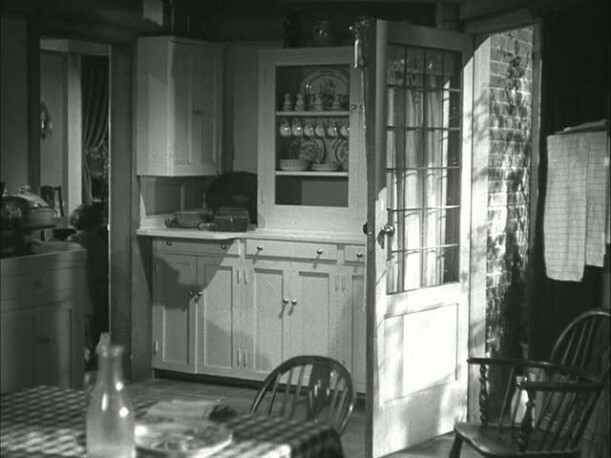 I am actually watching Mrs. Miniver as I write this, and the reason I am on the net while the movie is on is because I love the house so much, I wanted to see if it actually exists/existed, although it was probably a backlot prop house. I love the house with the fireplaces in every room, and wish homes were still built like this. Yep. That’s the house I’m supposed to be living in. Love that kitchen a lot, too.